*v1.21 - Updated for 2010 and added thumbnail support! Give me back my dialogs! Window box is a script (and tutorial) to show you how you can use Dotnet and Win32 methods to get back dialogs you have lost from using multiple monitors. Fixed an issue with monitor data, it now centers correctly on all screens. Sorry for the delay in finding that one. 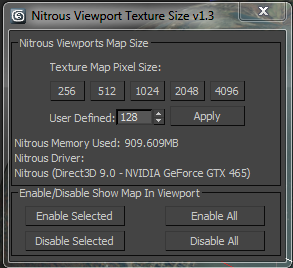 This is a simple script to set the Nitrous viewport texture limit size. To run it just open the script and evaluate it (Ctrl-E). v1.1 now adds a "Kelly's Tools" category in UI customize which I will start using for all future scripts." In previous versions of 3ds Max the Isolate Selection was implemented using MAXScript. In 3ds Max 2013, the functionality was reimplemented as an integral part of the User Interface. Due to this update the Isolate mode is now a toggle. This changes the legacy ability to isolate selected objects that are already isolated like what was possible in 3ds Max 2012 and previous versions. This script restores the legacy functionality when assigned to a keyboard shortcut and was created as a functional example of the code.